Glacier tongues colonization by the vegetation is one of the biotic responses to climate warming. 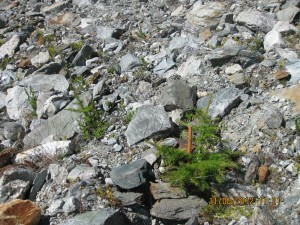 The growth of herbaceous plants, shrubs and trees on a glacier, however, is only possible when the glacier terminal portions are covered by debris. 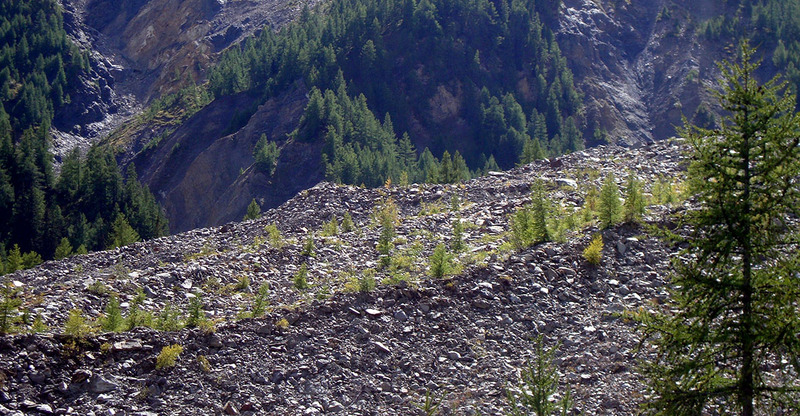 The debris derives from the increasing physical alteration of the rocks from the surrounding slopes and from the increasing glacier ablation rates. When the debris cover exceeds a certain critical value, the ablation rate is reduced thus protecting the ice from ablation. The debris cover is also home to other life forms, from yeasts and fungi to animals. However, trees require a rather thick debris cover, a reduced glacier surface velocity and a glacier tongue placed below the treeline altitude. The presence of supraglacial trees, beside documenting the effects of the ongoing climatic changes is a valuable source of climatic and glaciological information, that can be derived through the analysis of the tree rings. In fact, trees at our latitudes form a wood ring for each year of growth. Each tree ring retains a large amount of environmental information summarized in the ring width, in the anatomy of the produced wood and possible growth anomalies and in the tree-ring chemical composition. The analysis of long tree-ring series allow the reconstruction of past glacio-geomorphological events, their spatial distribution as well as their variations in intensity and frequency. 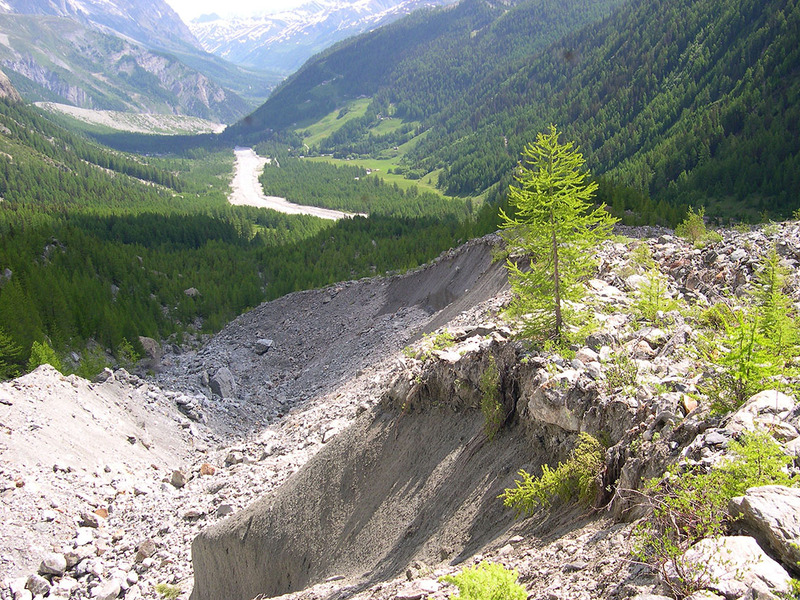 The debris-covered glaciers are extreme environments for tree growth: the substrate instability caused by underneath ice flow, by differential ablation and by glacio-karst phenomena, are responsible for various growth disturbances in supraglacial trees. After their germination, trees move downvalley, following the glacier surface velocity, performing a sort of annual registration of the substrate movements, which is readable in the tree-ring characteristics (compression wood, stem eccentricity, growth anomalies, resin ducts by mechanical stress). The analysis of vegetation and especially of the supraglacial trees (with their set of information on past and recent glacier dynamics) can be used for the spatio-temporal characterization of climate change impacts on glacier dynamics, and for the characterization of the stress effects on the glacio-related biological systems. HERE you can see the photos of the supraglacial vegetation. The photo were obtained as a result of field campaigns conducted in 2011 and 2012 on the Italian Alps. HERE you can connect to Google Earth for see the location of the glaciers for which supraglacial vegetation has been reported. HERE you can see the results of annual survey campaigns. We thank the operators and the volunteers for their active cooperation and for the next (2013) glaciological campaign we invite again to indicate the presence of supraglacial vegetation (using the form prepared on the site, that can be downloaded here), possibly collecting more information from the glaciers of Central and Eastern Alps. BENN, D, AND EVANS, J.A., 2010: Glaciers and Glaciation. 2nd edition. London: Hodder Education, 802 pp. BRANDA, E., TURCHETTI, B., DIOLAIUTI, G., PECCI, M., SMIRAGLIA, C., AND BUZZINI, P., 2010: Yeast and yeast–like diversity in the southernmost glacier of Europe (Calderone Glacier, Apennines, Italy) Fems Microbiology Ecology, 72: 354–369. CACCIANIGA, M., ANDREIS, C., DIOLAIUTI, G., D’AGATA, C., MIHALCEA, C., SMIRAGLIA, C., 2010: Alpine debris–covered glaciers as a habitat for plant life. The Holocene, 21: 1011–1020. GOBBI, M., ISAIA, M., AND DE BERNARDI, F., 2011: Arthropod colonisation of a debris–covered glacier. The Holocene, 21: 343–349. LEONELLI, G., AND PELFINI, M., 2013: Past surface instability of Miage debris–covered glacier tongue (Mont Blanc Massif, Italy): a decadal–scale tree-ring–based reconstruction. Boreas, 10.1111/j.1502–3885.2012.00291.x. MATTSON, L.E., AND GARDNER, J.S., 1989: Energy exchange and ablation rates on the debris–covered Rakhiot Glacier, Pakistan. Zeitschrift für Gletscherkunde und Glazialgeologie, 25: 17–32. PELFINI, M., DIOLAIUTI, G., LEONELLI, G., BOZZONI, M., BRESSAN, N., BRIOSCHI, D. AND RICCARDI, A., 2012: The influence of glacier surface processes on the short–term evolution of supraglacial tree vegetation: The case study of the Miage Glacier, Italian Alps. The Holocene, DOI: 10.1177/0959683611434222. PELFINI, M., SANTILLI, M., LEONELLI, G., AND BOZZONI, M., 2007: Investigating surface movements of debris–covered Miage glacier,Western Italian Alps, using dendroglaciological analysis. Journal of Glaciology, 53(180): 141– 152. RICHTER, M., FICHTER, T., AND GRÜNINGER, F., 2004: Pflanzen Auf Schuttbedeckten Gletschern – Wandernde Kuriositäten. Geoöko, 25: 225–256. STRUNK, H., 1997: Dating of geomorphical processes using dendrogeomorphical methods. Catena, 31: 137–151. TURCHETTI, B., BUZZINI, P., GORETTI, M., BRANDA, E., DIOLAIUTI, G., D’AGATA, C., SMIRAGLIA, C., AND VAUGHAN–MARTINI, A., 2008: Psychrophilic yeasts in glacial environments of Alpine glaciers. FEMS Microbiology Ecology, 63: 73–83. The debris-covered Miage Glacier is a unique glaciological feature in Italy because of the development of a supraglacial forest on the terminal portions of its tongue, which ends at an altitude of 1760 m a.s.l., well below the treeline (that in Valle d’Aosta reaches about 2500 m). 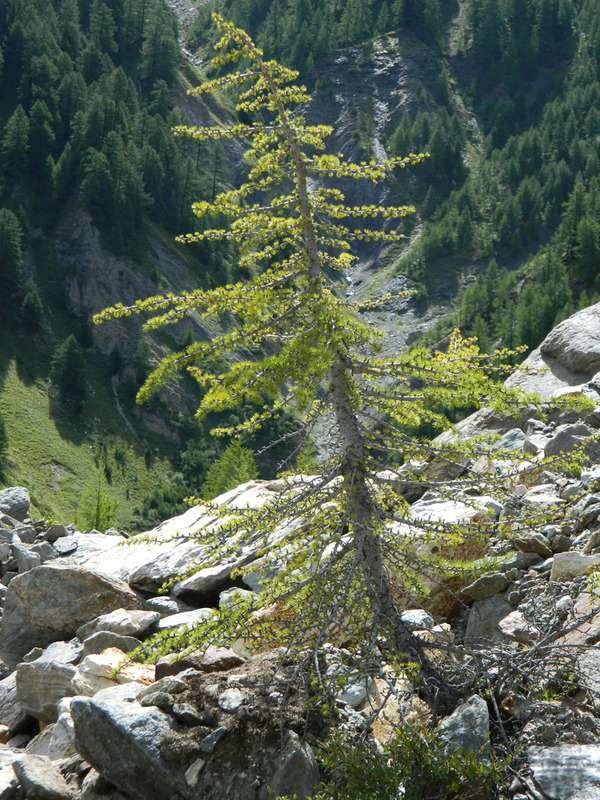 The two lobes that give to the Miage Glacier the characteristic pincers shape, are colonized by trees such as European larch (Larix decidua Mill.) Norway spruce (Picea abies Karst), shrubs (Salix spp.) and various herbaceous species. The larch vegetation is undoubtedly the most abundant and the single specimens record the stresses induced by movements of the underneath ice and debris, as evidenced by the shape of the stems often bent, deformed and twisted. Shrubs and herbaceous plants are mostly concentrated in small niches, characterized by the presence of fine debris. In general, the highest tree density of less than 30 cm height is found in correspondence of the areas characterized by fine debris. Young European larch trees growing on the Miage Glacier South lobe. Higher concentrations of trees are found where the debris has a finer granulometry and also clay and silt sediments are present (Photo A. Franchino, 2012). After germination the trees are transported downvalley towards the glacier front where they fall in the glacier forefield and die. The oldest trees found so far have an average age between 50 and 65 years and on the stems show the scars caused by the impact of the supraglacial debris moved by the glacier surface movements. Recent research have shown that the tree highest concentrations are located near the inner margin of the northern lobe, where numerous specimens of height less than 30 cm can be found. The southern lobe is instead characterized by lower density and a larger number of taller and older specimens. Old supraglacial European larch specimen growing in the terminal portion of the Miage Glacier South lobe (Photo D. Zannetti, 2012). The growth anomalies studied by means dendroglaciological techniques have shown that, over the period 1987-2006, the most unstable portion of the glacier (South lobe) colonized by trees, is located in the middle and lower portion, towards the outer margin. Tree survival on the Miage Glacier tongue is not only limited by the glacier flow into the valley, which is the cause of the tree dislocation up to the front, but also by the occasional ice cliff opening along the glacier margins. The ice cliffs are typically debris free, are directly exposed to the solar radiation and present high ablation rates. Therefore the ice-cliff laterally retreat and progressively “intercept” the roots and the stems, thus causing the tree fell in the escarpment. Trees growing close to the inner margin of the South lobe. These trees are intercepted by the ice cliff retreat due to the intense ablation that occurs on the debris-free ice surface (Photo T. Carnielli, 2004). The debris moved laterally from the glacier surface can gradually “close” the ice cliffs. The ice wall diminishes its slope, being again protected by the debris and allowing the trees to continue their downvalley movement towards the glacier front. 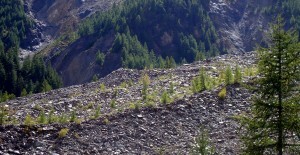 Inner portion of the Miage Glacier South lobe; trees growing along the margin are dragged outside the glacier by the debris falling along the lateral escarpment (Photo G. Leonelli, 2012). Recent dendroglaciological analyses have documented the passage of a kinematic wave that crossed the glacier in the late 1980s, causing both the glacier swelling and the destabilization of the supraglacial trees that have consistently documented the event. The glacier growing phase culminating in 1988 was recorded in the tree-ring anomalies caused by the substrate instability (responsible for the tree deviation from vertical position) due to the changes in the glacier surface height, that was first uplifted and later lowered. LEONELLI, G. & PELFINI, M. (2012) – Past surface instability of Miage debris-covered glacier tongue (Mont Blanc Massif, Italy): a decadal-scale tree-ring-based reconstruction. Boreas, 10.1111/j.1502-3885.2012.00291.x. PELFINI M., DIOLAIUTI G., LEONELLI G., BOZZONI M., BRESSAN N., BRIOSCHI D. RICCARDI A. (2012) The influence of glacier surface processes on the short-term evolution of supraglacial tree vegetation: The case study of the Miage Glacier, Italian Alps. The Holocene DOI: 10.1177/0959683611434222. BOLLATI I., SMIRAGLIA C. & PELFINI M. (2012) – Assessment and Selection of Geomorphosites and Trails in the Miage Glacier Area (Western Italian Alps) Environmental Management DOI 10.1007/s00267-012-9995-2. GARAVAGLIA V., PELFINI M. & MOTTA E. (2010) – Glacier stream activity in the proglacial area of an italian debris covered glacier: an application of dendroglaciology Geografia Fisica e Dinamica Quaternaria, 33 (1) 2010, 15-24. PELFINI M. (2009) – La rapida evoluzione dei geomorfositi glaciali e la relativa influenza sulle valenze dell’attributo scientifico: il caso del Ghiacciaio del Miage 131-143. in AGNESI V. (a cura) – Ambiente geomorfologico e attivita’ dell’uomo. Risorse, Rischi, Impatti, Memorie della Società Geografica Italiana, vol. LXXXVII, (I, 131-143). PELFINI M. (2009) – La vegetazione arborea per la ricostruzione dell’evoluzione glaciale e del segnale climatico in: SMIRAGLIA C., MORANDI G. & DIOLAIUTI G. (a cura di) (2009) – Clima e ghiacciai. L’evoluzione delle risorse glaciali in Lombardia, 129-142. Progetto grafico e realizzazione: Centro stampa Consiglio Regionale della Lombardia. PELFINI M. (2009) – Geomorfositi glaciali: il caso del Ghiacciaio del Miage, un debris covered glacier dalle caratteristiche particolari. Geoitalia 28 settembre 2009, 59-61. PELFINI M. (2008) – Ricerche dendroglaciologiche sul Ghiacciaio del Miage. L’informatore agricolo, anno 24 n.1 2008, 30-39. PELFINI M., SANTILLI M., LEONELLI G. & BOZZONI M. (2007) – Investigating surface movements of debris-covered Miage glacier,Western Italian Alps, using dendroglaciological analysis Journal of Glaciology, Vol. 53, No. 180, 2007, 141- 152. PELFINI M. (2006) – La vegetazione arborea epiglaciale e proglaciale Valle d’Aosta figlia dei ghiacci. Miti, realtà ed evoluzione dei ghiacciai valdostani” Musumeci, Aosta, 85-87. PELFINI M., BOZZONI M. & SANTILLI M. (2005) – Il Ghiacciaio del Miage: un geosito dalla peculiare valenza ecologica SLM, 23, 8-15.